HELEN, GEORGIA – Pennie Tour visited the North Georgia town of Helen to partake in Oktoberfest 2010. 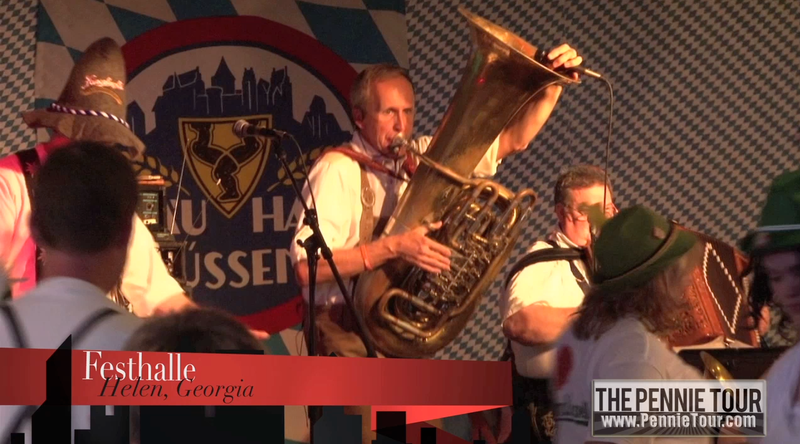 Not sure what we liked better – the Ompah music or the Bavarian beer! Since 1970, Georgia’s tranquil little town of Helen transforms into the ultimate North Georgia party town! Helen’s Oktoberfest offers Bavarian food, chicken dancing, Polka dancers in native costume, and German beer. Helen became a tourist attraction after the town changed its appearance to make the store fronts look like a Bavarian Alps village. 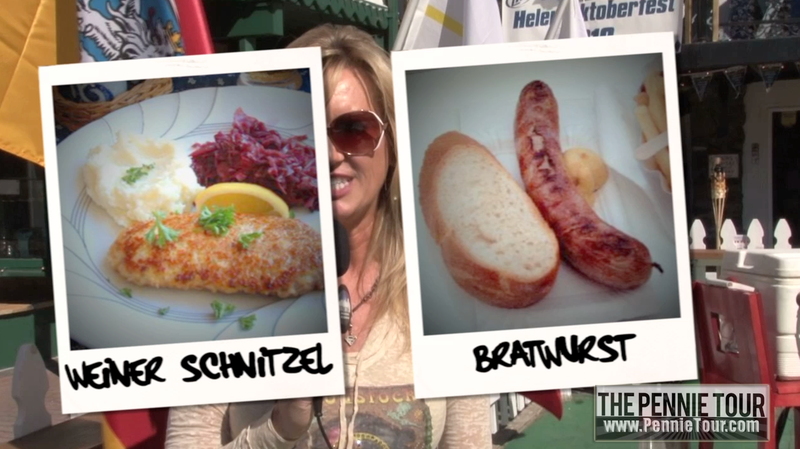 Helen copied Munich, Germany and started celebrating Oktoberfest to draw in even more tourists. Nestled along the Chattahoochee River, Helen receives many tourists in the summer months that take advantage of the river tubing, hiking and other outdoor activities offered. When fall arrives, even more people invade this Bavarian town to view the changing leaves and to involve themselves in Oktoberfest! Helen’s Oktoberfest begins on the second Thursday of September and runs through the first Sunday of November. A parade on the first Saturday of the festival kicks off the celebration. Pennie Tour took in the Bavarian influence of the partygoers and even experienced Helen’s famous dancing man who is a staple of Oktoberfest at Café International. Although the entire town participates in the Oktoberfest, Oompah-central is the Festhalle, where the bands play throughout the day. Can hang out in the Festhalle all day – you can purchase your cold beer (Leinenkugel is made in Milwaukee) and hot off the grill German-style wursts (sausages), listen to the band and dance! The most popular dance in Helen during Oktoberfest is the Chicken Dance. The “Chicken Dance” is a Swiss oompah song from the 1950s that has become a traditional dance of Oktoberfest. Oktoberfest lasts into the wee hours of the night. This year’s newest attraction was King Ludwig’s Bier Garden, which opened in September, where there was dancing and even more German beer! Festival attendees are not allowed to walk through the town of Helen with alcoholic drinks (to the dismay of many), so the Bier Garden proved to be the choice of many because of its open-air venue, music and outside dance floor. 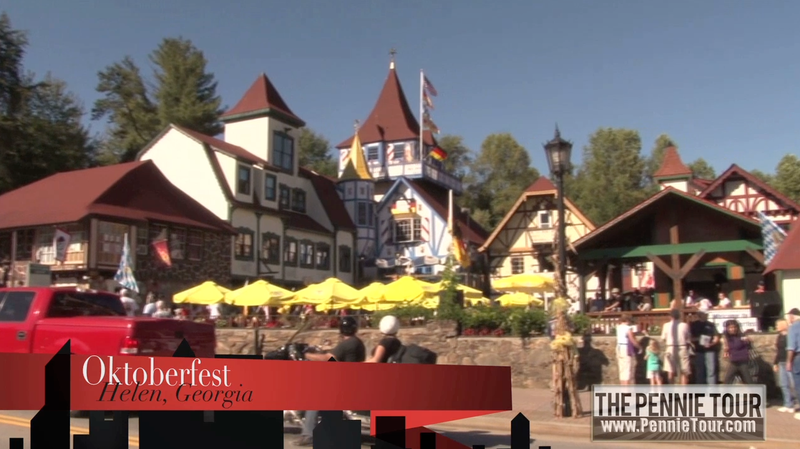 Visit Helen, Georgia the next time you are in the mood for bratwurst, or even Weiner schnitzel. A visit during Oktoberfest will make you feel as if you were in Munich! Hotels fill up fast – so it is important to book a hotel early. DANKE SCHÖN! Here is a website I created about Helen Ga. just out of a personal passion. I travel there frequently to enjoy the hiking, fishing, site seeing, and restaurants. I always have my photography and video gear in hand. I hope you enjoy all the high quality pictures, HD video, reviews and write ups. 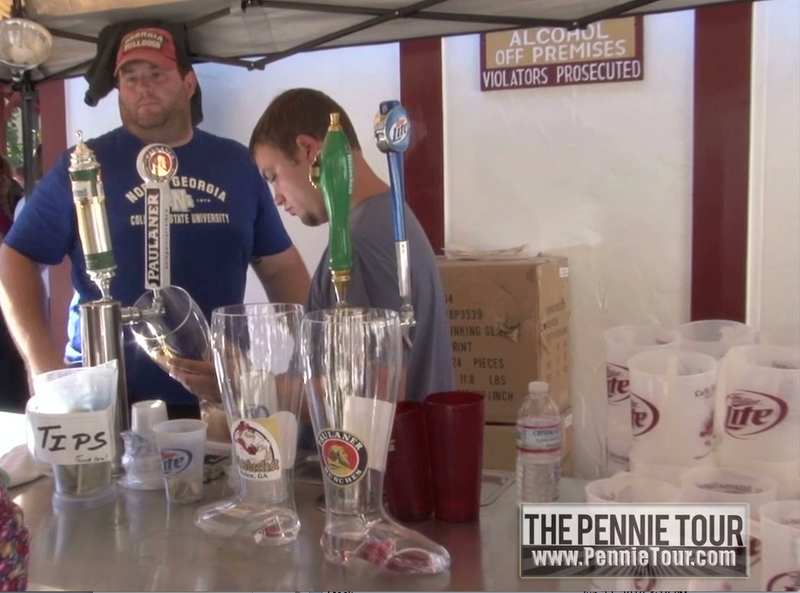 Feel free to embed The Pennie Tour on your website if you wish.